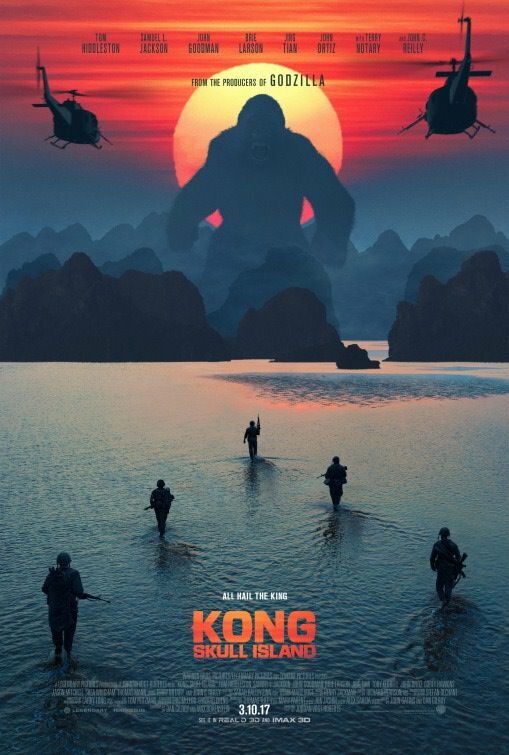 The allusions to Apocalypse Now and Joseph Conrad’s novel The Heart of Darkness are rife in newcomer director Jordan Vogt-Roberts action packed seventies set adventure film Kong: Skull Island. 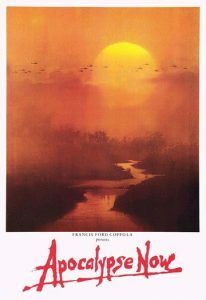 Featuring an international cast including British actor Tom Hiddleston, Oscar winner Brie Larson (Room), John Goodman, Samuel L. Jackson, John C. Reilly and Tian Jing (The Great Wall), Kong: Skull Island wastes no time on characterization or dramatic build up but rushes straight into an adrenaline filled action film set at the end of the Vietnam war in 1973. With a retro seventies soundtrack to match, Bill Randa played by John Goodman and Houston Brooks played by 24: Legacy’s Corey Hawkins get the go ahead from Senator Willis briefly played by Richard Jenkins (Eat, Pray, Love) to assemble a military team and journey to a mysterious storm ridden island in the South Pacific on an exploratory mission. The team consists of soldiers hanging for some more action after the American withdrawal from Vietnam including Preston Packard played by Samuel L. Jackson and Cole played by Shea Whigham (American Hustle) along with anti-war photographer Mason Weaver played by Larson and golden boy James Conrad, played by Hiddleston (Thor: The Dark World). As they approach Skull Island and drop seismic charges on the lush and malignant landscape, the team soon discover that a massive beast is guarding the island from vicious lizards. That beast is King Kong, that giant gorilla last seen on top of the Empire State building with a blond in his palm. Reference Peter Jackson’s 2005 epic King Kong. Director Jordan Vogt-Roberts cleverly wastes no time in cutting straight to the action as various teams on the island are separated only to be individually preyed upon by a variety of nefarious creatures including giant spiders. 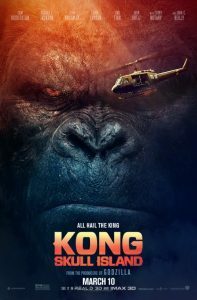 While Packard and his band of mercenary soldiers are keen on annihilating Kong, Mason and James stumble upon Hank Marlow, a crazed but good natured World War II pilot who accidentally landed on Skull Island back in 1944 and never left, even befriending the silent locals who worship Kong as their sole protector. Marlow is superbly played by character actor John C. Reilly, a role clearly referencing Dennis Hopper’s frenetic photojournalist in Apocalypse Now without the looming intensity of a Mister Kurtz watching over his horrific empire. Reilly brings empathy to the role of Marlow, another clear reference to The Heart of Darkness and advises the more sympathetic team that Kong is not that bad. A fact which is vividly illustrated by Mason Weaver’s wonderful encounter with the gigantic beast. Brie Larson gives a resilient performance as the only strong female lead in a basically all male film and has the best screen time with Kong, realizing that much like those brave soldiers hunting Kong, they are all as confused about this rapid reversal in the environmental food chain. Kong: Skull Island is unadulterated adventure, punctuated with cool photographic stills of exotic ethnography to capture a unique and terrifying experience where myth and science meet. With the help of a groovy seventies soundtrack and a stand out performance by John C. Reilly, Kong Skull Island gets a film rating of 7.5 out of 10. Highly recommended viewing.